At Five Lions Heating & Cooling we have options in your home with hot water heaters. We also have Tankless Water Heaters if better suited for your home or business. A hot water heater is referred to as a tankless system or called demand water heaters. These units do not maintain a tank of water at temperature. This eliminates the stand by losses and saves money and energy. They are available in gas or electric models such as Navien, Rinnai and Noritz. These systems use a flow sensor and a temperature sensor. When the unit senses the flow of water, it checks the temperature and turns on the heat as required. The heat can be produced by burning gas or with electricity. Some specialized units are called electric showers with electric heaters built in to the shower system. The flow is sensed and the electric element is turned on. The water is heated as needed. With the latest technology being used, units use microprocessor controls and can remember your favorite flow and temperature settings. These features ensure that you have a comfortable shower but also save water and electricity in the process. Tankless water heaters are the standard in Europe and Asia. A standard hot water heater will be great for the first couple of showers and may cause a long wait for more hot water. With a tankless hot water heater you can expect to take 2 showers simultaneously with no time limit. Tankless water heaters will save you money daily by lasting longer as well as lower life cycle and cost. When using traditional tanks the heater will operate periodically even though no hot water is being used due to the tank’s standby losses. These losses are due to the heat conducted and radiated from the walls of the tank and through the flue pipe. They represent 10% to 20% of a household’s annual water heating costs. When you open a hot water tap, cold water enters the heater and triggers the heating elements or burners. Your hot water tap acts as an ignition key for the energy used to heat the hot water you need. When the hot water tap is turned off, the heating system also turns off. WHY SWITCH TO A TANKLESS WATER HEATER? A condensing high efficiency tankless water heater will save approximately 30% over a standard water heater. A tankless water heater must be cleaned annually by flushing the unit with a descaling solution which adds maintenance costs. With innovative brands of tankless water heaters they deliver a never-ending source of hot water–whenever and wherever it’s required. With a properly sized tankless water heater, you will never have to worry about hot water being used simultaneously in multiple areas ever again. All tankless water heaters can easily adjust to your desired temperatures with a simple digital controller. 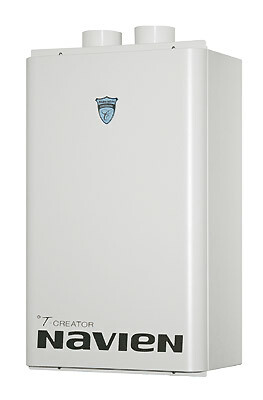 All tankless water heaters are ENERGY STAR certified, which will guarantee savings on your monthly utility bill. Convenience: Tankless Water Heaters do not run out of hot water. They keep producing hot water for as long as the hot water tap is open. Energy Cost: Tankless Water Heaters cost a lot less to run than a traditional tank. A typical tankless unit will run at 85-95% overall efficiency, compared to a typical tank that will perform in the range of 55-60% (including losses). Longevity: A tankless unit will outlive several hot water tanks. Direct venting: All of our Tankless Water Heaters have direct venting, which means that combustion air is taken directly from outside (through a pipe), and does not draw additional cold air through cracks into your home. Space saver: Tankless Water Heaters are very compact. Bacteria: Tankless Water Heaters store only cold water, reducing the risk of bacteria growth. Start now by lowering your cost with a Tankless Water Heater and a maintenance plan by calling Five Lions Heating & Cooling.